EARTH University graduate Miguel Sáenz (’05) is leading the charge to green Ecuador’s transit system – a move that saves money, improves human health, and preserves the lush country’s natural resources. 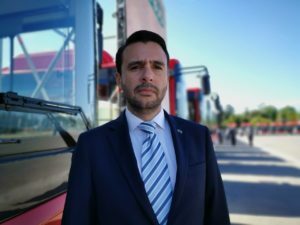 As national manager of products and sales at BYD E-Motors Ecuador S.A. – a subsidiary of the private Chinese multinational BYD Company – Miguel is working to de-carbonize Ecuador’s public transit system. He and his team are helping to phase out the nation’s pollutive gas- and diesel-chugging vehicles to make room on the roads for an impressive fleet of hydroelectric ones. This energy transformation effort is done in collaboration with Ecuador’s national government, local municipalities, transportation authorities and businesses, and is based on the development of public policy and incentive structures that drive the incorporation of zero-emission busses, taxis and delivery trucks. At EARTH, we recognize the hard work of our graduates in the field of technological innovation and the promotion of cleaner sources of energy. Miguel’s story is further evidence of the transformative impact that leadership education can have on the sustainability of development around the world.